JM Dasa wrote enquiring about the medicinal effects of garlic. 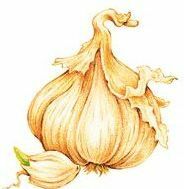 I referred him to this link, which basically is a list of links to everything I have ever blogged on the subject of garlic and onions, and to some extent how garlic can be used as medicine. If you wish to circumvent all those links and get straight to the medicinal uses, then click here.